In December 2005, I attended a symposium in a cinema in north-eastern Paris, organised by the International Platform Against Isolation. The event sprang from solitary confinement and other forms of state repression – a major fact of our time. Since 2002, these symposia have been held in various European cities. The starting point for them is the December 19-22, 2000 prison massacre in Turkey. Turkish soldiers and police attacked 20 of the country’s prisons to force their inmates, mainly political prisoners, into new F-Type prisons involving the use of solitary confinement and isolation cells. Twenty-eight prisoners were killed, and the repression triggered hunger strikes in which more prisoners have died and which are still continuing even now. Though repression in Turkey was the catalyst for the symposium, repression elsewhere was fully described at the Paris event, for state repression is international and the resistance to it must be international as well. Guantanamo and Abu Ghraib were just two of the more publicised forms of prison oppression covered. A keynote international speaker was the veteran African-American militant, Angela Davis, who described repression in the United States and the state’s use of the prison system there. Indeed, a key moment in the symposium was when Angela Davis and Ahmet Kulaksiz took centre stage amid applause from symposium participants. Ahmet Kulaksiz is famous in Turkey. His two daughters both died on hunger strike in 2001 in solidarity with political prisoners resisting solitary confinement in the F-Type prisons. It was noted at the symposium that isolation is not simply matter of prison practices. Prisoners might be isolated in cells, but organisations can be isolated by being placed on terrorist lists, countries can be isolated by being described as part of an axis of evil and political beliefs can be criminalised, as we have seen since the symposium in Council of Europe attempts to ban communism and its symbols. To the dead of the Commune – May 21-28, 1871. The Commune was not just French but international, just as the symposium was not just about Turkey, or France, but an occasion of international significance. Socialists and communists face repression, never more so than when they are genuinely internationalists. A sign of this was the participation of Sandra Bakutz in the symposium, where she chaired at least one session. Sandra was imprisoned in Turkey for six weeks last year, ultimately because international solidarity is more than just a word but a matter of personal practice. The symposium will continue. Its activities are clearly needed in today’s world. Commentators on the various ‘historic turning points’ meant to restore life to the corpse of the Good Friday Agreement in Ireland often use the word ‘choreography’. Translated the term means that the agreement, and all its patches and fixes, are the product of secret diplomacy. The deals are to be kept secret from the working class and the results gradually unveiled in a series of closely linked announcements and actions rather like a series of dance steps – hence the term choreography. The February report of the Independent Monitoring Commission was flagged up as a classic example of this process, meant to be the penultimate step in restoring a parliamentary body to head the Irish colony. Instead the report led yet again to the pratfall – the chaotic collapse of a whole series of deals guaranteed to be rock solid, followed by the sheepish admission of failure and the next attempt at a solution kicked into the long grass. This has been the case on each occasion that choreography has been attempted. There is always an unfortunate stumble at the end. The Provos always get the blame, even when the supposed cause, such as the Northern Bank raid, comes after Unionists have demolished the deal. The British explain regretfully that, because it is the Provo’s fault that the pact collapsed, they must make further concessions, move the agreement further to the right to meet the demands of Unionism and imperialism and begin the ‘choreography’ process all over again. Provo surrender and destruction of weapons, to be followed further on by Provo support for the police. Further concessions to the Provos – ‘On the run’ legislation (since collapsed) to allow fugitives to return, new ‘supercouncils’ with built-in nationalist majorities covering the Western areas giving the Provos a sort of ‘Stormont lite’ where they could hold political office, special arrangements to ensure that restorative justice organizations in nationalist areas are not too closely bolted to the RUC to avoid Provo embarrassment and the announcement that suspended parliamentary allowances are to be paid and backdated. Concessions to Paisley involved conciliation of the viciously sectarian ‘Love Ulster’ campaign, throwing money at bigots and paramilitaries and moves to resolve the issue of Orange parades in the interests of the sectarians. Not only are the Orange to be conciliated, but a new ‘Cultural Commission’ is to be created to oversee nationalist events such as St. Patrick’s day despite the fact that these are not in themselves sectarian. A major concession to Paisley was the October 2005 appointment of DUP nominee Bertha McDougall as chair of a new victims agency. This was a direct appointment by the British, avoiding all the normal procedures supposed to guarantee fairness in appointment. The starting point of the political concessions to Unionism go back to the Leeds Castle agreement of September 2004. In this secret agreement it was indicated that if the DUP would go into government there would be no need to support the coalition they were joining by voting for it. This deal fell through when the DUP walked away in December, but in the way of such things much greater concessions are needed now. A new settlement would have to strip out much of the tinsel and decoration offered to nationalism and leave a much more unvarnished form of the Orange state that was the status quo ante. The concessions were to be linked to pressure on Paisley The British have threatened to disband the RIR – the local protestant militia within the British army. They threaten to hand almost half of local government over to the Provos, to impose massive cuts, price hikes and privatisation in public service and to stop the pay of Stormont MPs. US Special Envoy Mitchell Reiss was to bring the authority of President Bush to bear. The pressure would be linked to two Independent Monitoring Commission reports. These reports, produced by the safe hands of the chair, former Alliance leader and Stomont speaker John Alderdice, would first give the Provos a progress report, designed to force the DUP into talks, followed by a second report giving them a completely clean bill of health and the go-ahead for the establishment of a new Stormont parliament. It didn’t work out like that. The concessions to Paisley were real enough. The pressure wasn’t. A deal on the RIR is being worked out in bilateral talks with the British, with no need to agree to talks with the Provos. The DUP don’t like republicans getting office through local government reform, but it will be in the poorer areas and bolster the sectarian divisions that they depend on. The DUP waged a long campaign to disband the previous parliament and it gave them the majority position in unionism – threats of pay cuts will have no effect. The DUP have posed far more convincingly than the Provos, the unions or the left as opponents of water charges and service cuts – a dishonest populism only possible as long as they stay out of office. The British will be doing them a favour if they do all the dirty work themselves. Finally the US envoy spent his visit pressuring the Provos to support the police. The fact is that the Paisleyites want a parliament – they just don’t want one that involves sharing power with Catholics. Just before the launch of the IMC report, their own policy, Facing Reality was released. Their proposals would see the final scrapping of the Good Friday proposals in favour of a local assembly without a government – the British would continue to rule with advice from the assembly. By launching the document they were ruling out in advance any discussion of a power-sharing body or implementation of the GFA. The Paisleyite bombshell was followed by dramatic leaks from the Belfast policing board. On 13th December security minister Shaun Woodward had claimed that the IRA were no longer involved in illegal activity. He was contradicted by the deputy chief constable of the RUC/PSNI, Sam Kinkaid and involved in a row with the DUP. The result was that any positive outcome from the first IMC report was effectively negated and the possibility of direct talks with the Provos disappeared from the agenda. Then came the IMC report itself. We are of the firm view that the present PIRA leadership has taken the strategic decision to end the armed campaign and pursue the political course which it has publicly articulated. We do not think that PIRA believes that terrorism has a part in this political strategy. We have since received reports that not all PIRA’s weapons and ammunition were handed over for decommissioning in September. What this does is blow out of the water any possibility that the second report, no matter how positive, can be the Provo’s ticket into government. In fact they are now in the invidious and impossible position of having to prove that they have no weapons! Not only that, but their last coin, support for the police and joining the policing boards, is being taken from them. At the DUP conference (in reality a victory rally) Paisley announced that the DUP would not accept Provo membership and would boycott the police committees if the Provos joined! None of this is in any way related to a Provo threat or to the military capacity of the organisation. All agree that any remaining military capacity is minute, that fund-raising activities are being wound up and money moved into mainstream areas such as property. If the Provos are spying so what? The DUP publish daily statements based on information from police informants. The central allegation, around which the Provos back is being broken, is that there is a report that they retained weapons! What is happening is essentially political. The IMC are unable to investigate anything and essentially put a political gloss on police and intelligence reports. What is being said is that unionism is refusing to accept the republican surrender. The DUP are repudiating any suggestion that the decommissioning of the IRA will lead to a coalition government in some way loosely related to the Good Friday Agreement. They are not saying that no agreement is possible, but that it will be based around their proposals to have a local assembly without a government. They refuse to accept the Provos surrender until they accept that reality. But it is not the Paisleyites who rule. What does Britain say? When challenged by the policing board they mutter reassuringly. Their political representative ruling the police, Hugh Orde, supports the board. Faced with the IMC report they roll out General John de Chastelain and the international report to reassure everyone that the report of an arms hold-out – essentially statements of political opposition from with the RUC – have been investigated and ruled out. What we must remember is that both commissions are attempts to conciliate unionism about an issue that should require only a simple government statement, followed by acceptance by the ‘loyal’ unionists. What I do expect of all the parties – the DUP included – is to find a way forward where we can get the assembly up and running and thereafter power-sharing established and restored with ministerial functions being exercised by elected politicians in Northern Ireland. Careful reading of the convoluted wording of this statement indicates that the British do not expect a fast race, nor do they expect to end at the finish line of the Good Friday agreement, but rather closer to the proposals put forward by the sectarians. This helps to explain the outing of Denis Donaldson. At the time it was suggested that this was to protect a ‘Mr Big’. The British promptly outed six other leading republicans. Clearly the British are not outing half the republican leadership to protect the other half. The technique in use is common in interrogation. The interrogator befriends you, only to unexpectedly deal a crippling blow. The blow is He doesn’t want a parliament that involves sharing power with Catholics intended to confuse and disorient you while at the same time telling you that you have not done enough to meet the needs of the interrogator. The republicans have not done enough. They need to do more. What then of Fianna Fail, Sinn Fein’s ally in the nationalist family. Will they not protest the tearing up of a formal international agreement? The answer came from Taoiseach Bertie Ahern when the travelled to a meeting of Loyalists last year to assure them that, in the view of Fianna Fail, the Irish national question had been resolved . A series of Gardra raids in advance of the IMC report, targeted at republicans and said to be aimed at disrupting their financial operations was a strong hint about what Irish capital expects from Sinn Fein. The IMC report and the events around it indicate that the promised land of a sectarian state with an equal share of sectarian privilege that the republicans signed up to is no longer on the table. The DUP are now writing the agenda and will not agree anything that does not guarantee the continuation of the sectarian supremacy and discrimination that are their stock in trade. The Stormont of old may not be achievable; a nasty little sectarian hell-hole with many of the characteristics of the past regime is now what is on offer. After four years of existence it is time to face some hard truths with respect to the antiwar movement in this country. And in facing those truths it becomes impossible to deny that by and large this movement has failed to effectively challenge Blair’s government with respect to the war; failed completely to impact on the government’s ability to aid the US in the prosecution of the war; failed to precipitate the political crisis required to affect the government’s policy or plans with respect to the war; failed to turn the mass support present in the run up to the war into the kind of vibrant, conscious and militant movement required to constitute any kind of challenge to the status quo after three years of war and occupation. We only have to look at the recent deployment of more Scottish troops to Iraq, the recent announcement by the government that another 6,000 British troops are to be deployed to Afghanistan, to see evidence of the absolute failure of the antiwar movement to present a strong challenge to the ruling class. Not that anyone should glory or derive satisfaction from this sad state of affairs. On the contrary, one of the biggest regrets all socialists and people of consciousness should experience, now and in years to come, is that such a major opportunity was lost to challenge the State and alter the course of history in as fundamental a way as was undoubtedly possible at the height of the antiwar movement in the run up to the war in late 2002 and early 2003. February 15, 2003 was a historic day not only in this country but throughout the world. On that day, in over 600 towns and cities internationally, an estimated 15 to 20 million people took to the streets to raise their voices against war, against imperialism; against, by extension, the free market variant of capitalism which lies at the root of the war in Iraq and the current crisis facing our planet. That said, the only two countries in which this outpouring of anger and protest could possibly have had any meaningful effect were the UK and the US, given that these were the two nations leading the march to war. Within the US on that day, despite it being a nation in the clutches of a wave of nationalism and fear post-9/11, 2 million came out in over 150 towns and cities to raise their voices against going to war. For those involved the sense that something important was or could be happening – the laying of the foundations of a new political movement of such power and force that it could not simply be ignored by the ruling class – was palpable. However, for potential to materialise into actuality human agency in the form of conscious leadership must be present. Alas, in the case of both the US and UK antiwar movements it is precisely this kind of conscious leadership that has been lacking. And whilst the US antiwar movement can perhaps offer the excuse that they represented the minority view in the nation as a whole, given the fear and nationalism that had been whipped up by a government aided and abetted by a complicit media, the UK antiwar movement cannot. When you are two million in the streets of London you own the city. It is yours, undeniably and emphatically. It then becomes a question of what you do with the city on the day and in the hours that it is yours. There is no question that on February 15, 2003, a political crisis could have been created if only the leadership had seen and then seized the opportunity. What was to stop them taking over the Houses of Parliament, Buckingham Palace, indeed any major symbol of ruling class power and privilege? Nothing stopped them except their own lack of courage and willingness to mount a serious challenge to the British State. Rather than rely on the moral rectitude of a ruling class in whose interests this war was about to be waged, the leadership of the movement on this day had an obligation to seize the opportunity presented by 2 million people on the streets to take the struggle as far as they could. Yes, there may have been violence. Yes, people may have been hurt. But in comparison to the tens of thousands of innocent Iraqis about to be slaughtered, the one and a half million already killed due to sanctions, surely this would have been small price to pay for the very real possibility of rocking the government back on its heels and seriously hampering Blair’s ability to continue to support Bush and the right wing cabal surrounding him. The knock on effect which such a crisis in the UK would have had on US antiwar movement and US body politic is anybody’s guess. What we can say for certain is that there would have been one, and that it would undoubtedly have produced more political and social opposition to the war in the US than there was. History provides irrefutable proof that peaceful protest only ever produces marginal gains for working, poor and/or oppressed people, while militancy and force can and does alter history. The Labour movement, both at home and abroad, was built on the back of violent struggle, as was the movement for women’s rights, gay rights, and so on. The antipoll tax movement was a movement of mass civil disobedience which culminated in the riot of Trafalgar Square, an event which shook the British ruling class to its foundations and led directly to the fall of Thatcher. From the streets of Ireland to the townships of South Africa, and most recently in the streets of Paris, it has been the willingness of people to confront the state, thus exposing its true savage and violent nature, which has radicalised movements and thereby produced qualitative change. Many of a weaker consciousness within progressive movements continually tout the example of Gandhi or Martin Luther King as the model to emulate as a way forward to social change. This does a disservice to the truth and a service to the establishment, who would enjoy nothing better than to see ineffective peaceful protest after protest take place while they continue to plunder the planet. In the case of Gandhi, the British Empire had become unsustainable, with the collapse of the British economy after World War II, and it was either sacrifice political power in India in order to retain economic power in the face of Gandhi’s peaceful and benign movement, or face the real possibility of losing it all in the face of the violent and secular forces that were also arrayed against them, and which were attracting increasing support away from Gandhi. The British opted for Gandhi. Something similar took place with respect the US Civil Rights Movement led by MLK. His nonviolent movement was only as effective as it was due to the rise of black nationalism in black ghettoes represented by such figures as Malcolm X, Stokely Carmichael, Fred Hampton, and others. The US government, under John F. Kennedy and later Lyndon Johnson, finally caved in and embraced MLK and the cause of black civil rights, a man and a cause whom the white establishment had previously reviled, in order to nullify and check the rise of the much more potent black militancy which constituted the real threat to the status quo. Indeed, at one time J. Edgar Hoover, then head of the FBI, declared the Black Panthers to be the biggest threat to the internal security of the United States. It was this militancy, the threat it posed, which led directly to the rise of MLK and the nonviolent Civil Rights movement that he led. The last national demonstration against the war in London, which took place in September 2005, was pitiful. 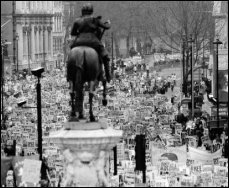 A mere 25,000 people marched behind the empty and anodyne slogan, ‘March For Peace And Liberty.’ A slogan of which the Salvation Army would be proud, surely this demonstrates beyond a shadow of a doubt the degeneration which has taken hold within the antiwar movement. It is a movement shorn of all militancy, fire and coherence, one that has never managed to break out of a comfort zone consisting of replicating the same tired and worn actions time after time, in the forlorn hope that somehow, miraculously, they will suddenly produce the desired result, cause Blair to experience some sort of Damascus moment and order the withdrawal of British troops from the Middle East. This will not happen. As a complement to the courageous resistance being offered by the Iraqi people to the occupation, the UK antiwar movement must take a long hard look at itself. Nothing will change significantly unless people are willing to make sacrifices and take risks. The only effect that attending a peaceful demonstration has is to make those participating feel better. This clearly isn’t good enough. Ultimately, the verdict of history will be a harsh one unless sooner rather than later the antiwar movement moves beyond the impotence associated with bourgeois pacifism. Nothing better illustrates the hypocrisy of imperialism and its apologists at the United Nations than the nuclear issue. The break up of the Soviet Union and the subsequent diplomatic thaw ended the Cold War. The peace dividend that was supposed to flow from this would allow the finger to be taken off the trigger of the nuclear arsenals of the 5 acknowledged nuclear states. We were told that Mutually Assured Destruction (MAD) was no longer an option. However, a Marxist understanding of the nature of capitalism in its imperialist stage meant the preparation for war would continue. In the past few years, the nuclear debate has moved back to the centre of international politics. Membership of the nuclear club is the must-have status symbol of every aspirant, ‘wannabe’ imperialist state. Pakistan and India are engaged in a sub-continental arms race, Mordechai Vanunu exposed the nuclear ambitions and capabilities of Israel, Saddam Hussein was thwarted in his drive to build the first ‘Arab’ bomb and now there is a stand off between the UN and Iran over the latter’s nuclear developments. All indicatethe seriousness of the situation. a landmark treaty, whose objective is to prevent the spread of nuclear weapons and weapons technology, to promote cooperation in the peaceful uses of nuclear energy and to further the goal of achieving nuclear disarmament and general and complete disarmament. The Treaty represents the only binding commitment in a multilateral treaty to the goal of disarmament by the nuclear-weapon States. These are worthy aims, but the reality of the last 35 years is very different and is a case study exposing the lie of the neutrality and objectivity of the UN. This glowing testimony to the NPT is exploded by the global experience of the last 3 decades, exemplified by current developments. Over the years, the 5 nuclear states above have all been complicit in providing states in their ‘sphere of influence’ with the necessary technology, which has not prevent(ed) the spread , but has actually fuelled the proliferation of nuclear weapons. This continues today. Although not signatories to the NPT, India, Pakistan and Israel have escaped UN sanctions and anything but the mildest official criticism over their development and testing of nuclear weaponry. Where are the UN Security Council resolutions, the call for political and economic sanctions against these regimes that brazenly flout this landmark treaty ? Contrast this with the imperialist priority given to preventing both Iraq and Iran from acquiring such technology. Like UN Security Council resolutions, the NPT is rolled out as justification for isolating and vilifying ‘rogue’ states. While the members of the ‘axis of evil’ are threatened, cajoled and invaded, Western imperialism’s client states can ignore the NPT with impunity. The stench of nuclear hypocrisy is overpowering. While the US and UK ramp up the pressure on Iran and its nuclear ambitions, by threatening action at the UN and pressurising the IAEA to do likewise, Tony Blair is bragging about upgrading Britain’s nuclear capability both in terms of energy production and weaponry. This is in blatant opposition to the NPT which commits signatories to furthering the goal of achieving nuclear disarmament and a binding commitment….to the goal of disarmament by the nuclear weapon states . In the last month, Blair and, Defence Secretary, John Reid, have already pledged themselves to maintaining Britain’s nuclear ‘deterrent’. They are already looking at what will replace the Trident nuclear missile system. So, far from upholding the spirit of disarmament in the NPT, they are actually looking to upgrade. While lecturing the North Koreans and Iranians on the folly of possessing nuclear capability, they are preparing to spend an estimated £20billion enhancing their own. This addiction to weapons of mass destruction is not just confined to Britain. At the start of the year, French President, Jacques Chirac declared he was prepared to use nuclear weapons against any incident of state sponsored ‘terrorism’ against France. Like Blair, these comments come at a time when France is also engaged in a debate about upgrading its own nuclear capabilities. The Labour government is also trying to rehabilitate the ‘N’ word in relation to Britain’s energy requirements. Blair is strongly indicating that he is in favour of a building programme of new nuclear power stations. The impending energy crisis provoked by a thirst and dependency on fossil fuels is concerning the dependent Western economies. The use of oil, gas and coal is no longer guaranteed for a variety of reasons. The biggest suppliers of gas and oil are in the area of the world destabilised by imperialist intervention, inevitably leading to price rises and supply restrictions. Combined with that, major oil producers such as Iran and Venezuela are flexing their political muscles that come with substantial oil reserves, and threatening to withdraw supplies to the US. Likewise, Russia recently caused palpitations in Europe when it raised gas prices to Ukraine. Until the election of Viktor Yushchenko, Ukraine had enjoyed Russian gas at favourable rates; as the political regime changed in Kiev so Russian gas prices have increased. Iraqi oil production levels are still a long way from the rosy predictions of the neo-con mates of Bush. These uncertainties are compounded by the environmental consequences of the continued burning of fossil fuels. It is inconceivable to think that new nuclear power stations are being planned for Britain, while there is still no solution as to how to dispose of the toxic waste that this source of power produces. This waste remains dangerous for thousands of years. Combine this with the ‘war on terror’ and the panic over ‘dirty bombs’, and it is inconceivable that the government could promote the building of such explosive targets. The world is threatened by any or all of the regimes of Bush, Blair, Chirac, Putin, Sharon, Musharraf, Ehud Olmert or Mahmoud Ahmadinejad. Humanity remains in danger whilst any of them have their finger hovering above the nuclear button. Ultimately, it is not them as individuals who threaten the existence of the world, but it is the system of capitalism and profit which endangers the planet. Unless we challenge the very system that puts that interest of profit before the interest of humanity, then the horrors of Hiroshima, Nagasaki, Chernobyl and Three Mile Island will inevitably be repeated. Which Way Now for the SSP? Why have the SSP retreated? It is three years since the massive international demonstrations, held on February 15th 2003, in protest against Bush and Blair’s’ impending war in Iraq. These were the biggest demonstrations ever seen in the world. And, just three months later, the SSP won six seats in the Scottish Parliament, a fact widely recognised as a substantial breakthrough for the international socialist movement. Conventional wisdom in our party thinks that everything was going well, until the crisis occasioned by Tommy Sheridan’s resignation in November 2004. Accusations were levelled against the party of internal bickering, backstabbing and treachery. Needless to say, things were considerably more complex. Nevertheless, whichever side comrades took in the ensuing debate, there appears to be common agreement that the resignation and its handling blew our party off course, and that it is still suffering from this. And then, just last month, we had the Dunfermline by-election. The Lib-Dems pulled off an impressive victory, anticipated by virtually no one. New Labour, and Gordon Brown in particular, were humiliated. Yet the Lib-Dems had entered the campaign with only a caretaker leader, a scornful press relishing the party’s recent history of internal bickering, backstabbing and treachery, and making the most of accusations of alcoholism, resort to rent-boys, and personal denials of sexual orientation! Although the earlier press attacks on our party were unpleasant and malevolent, they were not as sustained as those the Lib-Dems experienced recently. Yet, these attacks didn’t seem to derail the Lib-Dems in the same way. So perhaps we should be looking elsewhere, at more fundamental reasons, for the fall away in support for our party. This will involve looking at the SSP in a wider, international context. First, it is necessary to look at the other side of the massive February 15th 2003 demonstrations. Unlike the post-1968, anti-Vietnam War demonstrations, these were not mobilised on a specifically anti imperialist basis. Support was sought on liberal pacifist lines. No matter how massive, such protests left the US and UK ruling classes with much more room for manoeuvre, since they didn’t challenge their interests fundamentally. Illusions were built up in a possible UN solution, despite the UN being run by a Security Council, which answers only to the major imperial powers. Some even saw France, which opposed the war in Iraq, as showing the way. Of course, the French ruing class only opposed the Iraq war for its own particular imperialist interests. It has been up to its neck in imperialist ventures in Africa (including sharing some culpability for the notorious Rwanda genocide) and it supported the US-led overthrow of the elected Aristide government in Haiti. Even though the widely welcomed electoral defeat of the Conservative, Aznar-led, government in Spain did lead to the removal of Spanish troops in Iraq, many were redeployed to Afghanistan and Haiti, by the incoming ‘Socialist’ government. They helped out US imperialism in another role. The longer-term danger, of dependence on liberal pacifist opinion, was highlighted, in both the USA and UK, by their principal anti-war movements’ wooing of the Democrats and the Lib-Dems respectively. These are both very much pro-imperialist parties. Both parties believe they offer imperialism a better, less foolhardy, strategy than that being pushed in Iraq by Bush’s Neo-Conss and Blair’s New Labourites. Not surprisingly, the Democrats and Lib-Dems have been highly ambiguous in their ‘opposition’ to the war. However, the anti-war movements’ strategy of trimming demands to what was acceptable to these pro-imperialist parties’ leaderships had the effect of building them up as a credible electoral opposition. This fitted in well, with ruling class attempts to marginalise the anti-imperialist component of the movement. The international Left, including the SSP, hasn’t appreciated the current imperialist strategy. The Left has concentrated nearly all its attentions on Bush and Blair, or the Neo-Cons and New Labourites. However, the western ruling classes have learned lessons from the earlier massive mobilisations of the anti-globalisation and anti-war movements. They could see the threat posed by an international mass movement, outside the control of the mainstream political parties. They know how important it is always to have a safe government-in-waiting. Thus they have deliberately created a political space for a soft liberal imperialist alternative. This has meant a sustained political and media offensive to present such parties as the US Democrats and the British Lib-Dems as more caring and less belligerent. The international Left has fallen for this right across the board; not only in the USA where it has traditionally been weak, but in France and Italy too, where it has been much stronger. The Left has concentrated its attentions on the ‘big, bad wolf’ – Bush Blair, Le Pen or Berlusconi, conceding much of the political terrain to the ruling classes’ officially-promoted liberal ‘alternatives’. 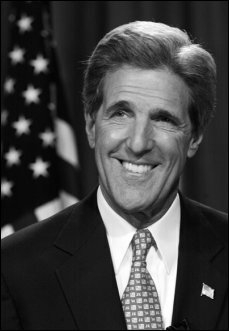 At the time of the November 2004 US presidential election, the antiwar movement fell in behind the Democratic candidate, Kerry. Yet he argued for even more troops to be sent to Iraq, and was even more pro-Israel than Bush! Prominent anti-war activists also argued for a vote for Lib-Dem candidates in the June 2005 UK general election. The reason liberal ‘opposition’ candidates are usually the best placed to win elections, is that they are the most acceptable to the ruling class, and are actively promoted by their media, the better to undercut more radical challenges. In the French presidential election, the majority of the Left ended up giving its support to Chirac as a ‘lesser evil’ to Le Pen. Yet Le Pen enjoyed no significant French ruling class support and was hardly in a position to launch a fascist take-over with a Mussolini-like march on Paris. The Left’s capitulation allowed Le Pen to appear as the only ‘opposition’ to the French ruling class. This year, in the forthcoming Italian general election, Rifondazione Communista is not only arguing for a vote for Prodi’s Blairite Olive Tree Coalition against Berlusconi, but is even considering an offer of entering a wider governmental coalition! The last Olive Tree coalition governmentcollapsed in ignominy, after launching major attacks onworkers. In Scotland we have the ‘privilege’ of seeing how a liberal ‘opposition’ behaves, when it takes office. For, of course, the Lib-Dems are already in coalition with New Labour in the Scottish Executive. NATO use of Scottish airbases for the war in Iraq, US ‘rendition’ flights, undermining the right to protest against the imperialist warmongers at Gleneagles – for the Lib-Dems it is either outright acceptance, or only the most timid of reservations. In Scotland, we have also seen just how far the ruling class is prepared to go to marginalise the Left. At last year’s G8 Summit, held at Gleneagles, the ruling class made a deliberate attempt to colonise the opposition. The ‘Make Poverty History’ campaign, led largely by charity organisations, was adopted and promoted by New Labour. Blair and Brown in no way felt threatened by the officially-sanctioned activities on July 3rd, 2005. Rather they saw the hundreds of thousands of demonstrators in Edinburgh, and the concert-goers in Hyde Park, as constituting a mass lobby for New Labour’s efforts at Gleneagles. Blair and Brown wanted the G8 leaders to pursue a better strategy to promote imperial interests worldwide, particularly in Africa. Geldof and Bono merely acted as their populist running boys, with the ear to the rich and powerful on one hand, and another for a concerned populace, safely assembled on tightly-policed demonstrations or cocooned in pop concerts. We, in the SSP, got one indication of how far the ruling class is prepared to go to beat down any principled opposition to imperialist designs. Our MSP’s mild parliamentary protest was met with an unprecedented attack on democratic rights. The Scottish Executive (at the undoubted prompting of Blair and his allies) launched this attack. Once the British ruling class (including its Scottish component) had indicated what they considered to be limits to any protest, the liberal ‘opposition’ – the SNP and the Greens, ever eager to appear acceptable – joined in the attack. After all, they too want to follow the footsteps of the Lib-Dems, and enter into a future government coalition, here they would bow to the needs of US and British imperialism and the global corporations. The official attack on the SSP presented the SNP and Greens with a perfect opportunity to show off their respectable credentials. Of course, a key factor, which has contributed to the growing marginalisation of the Left, in Scotland, the wider UK, and Ireland, has been the lack of sustained working class opposition to the current ruling class offensive. 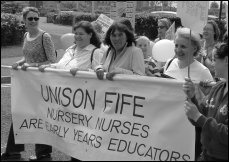 The nursery nurses ran a spirited strike campaign in 2004, but were unable to break out of the isolation imposed by a UNISON leadership, wedded in partnership to New Labour. Even our own excellent parliamentary campaign of support could not overcome this weakness. Similarly, the government has found it relatively easy to divide those forces which threatened it over pensions. Some on the Left (including the CWI platform) have even gone along with deals which have divided workforce from workforce, and long-established workers from the newly-employed. In Ireland, last November, a massive strike and demonstration took place to challenge Irish Ferries’ attempt to smash the minimum wage and give them control over those they employed. Yet it too failed to deliver a knockout blow. This campaign remained firmly under the control of a union leadership wedded to government in a partnership deal. The much-vaunted Awkward Squad has turned out to be not that awkward – well at least as far as New Labour and the employers are concerned. Many such leaders have backed down and now only seek a more prominent place for themselves in the designs and dealings of any Labour government. Winning leading trade union officials to the SSP will not necessarily enhance our reputation with the rank and file, who have become cynical over the continuous unnecessary compromises and retreats. Our policy of having a worker’s MP on a worker’s wage is both principled and popular. It is about time our leadership stopped shillyshallying over the policy of having trade union leaders earning the average wage of the members they represent. This would also help to provide a longer term basis for building up a genuine rank and file movement in the unions. Currently, the SSP faces a similar situation to the wider international Left. A ruling class counter-offensive has rolled back many of the gains we made in the first years of this decade. The Left is once more relatively marginalised. It is this, more than anything else, which explains the current doldrums, the SSP faces, particularly when contesting elections. Even if Tommy were to come back as SSP leader, it is very unlikely that this would overcome the wider problems we face. There were many in the SNP, who thought that the return of Alex Salmond would revive their party’s fortunes. Recent poor results, in by-elections in West Lothian, Cathcart and Dunfermline, have shown the falsity of this argument. At the moment, the US and British ruling class are fully committed to New Labour’s policy of ‘devolution-all-round’ and know it would be hard to find a party more committed to promoting wider imperial and corporate interests. The SNP still have some way to go in convincing these powerful forces that their ‘independence’ project would offer them a better deal. Nevertheless, the SNP leadership is falling over backwards to demonstrate its pro-imperial and pro-corporate intentions. Of course, the SSP can not follow a similar path and try to gain acceptability by showing that we too are ‘sensible’, ‘responsible’ and ‘acceptable’. To pursue such a path would end the most impressive political gain we still retain – socialist unity in Scotland. Unfortunately, the current marginalisation of the SSP has led to various strategies being promoted, which would threaten this unity. The SSP’s nationalist wing (the SRSM and Kevin Williamson), which wants to turn the party into a pressure group on the SNP, represents the most obvious immediate threat to unity. The SNP Rightwards trajectory is obvious to most. Despite this, the SSP’s nationalists now want to consign the party’s hard-won democratic republican orientation to some distant future. We can remain sentimental republicans but republicanism would have no real bearing on our current strategy. Instead we should follow the SNP’s forelock-tugging constitutionalist path of pursuing a referendum on ‘independence under the Crown’! This would permit the SNP to pursue itsstrategy of simultaneously enhancing the position of Scottish capitalists and better integrating them into the workings of the ‘New World Order’, without facing any real Left challenge. There are other dangers too facing the SSP. The SW platform has now got itself into a bit of a rut. More than any other Left force, it has been responsible, both in the antiwar movement and anti globalisation movements, for bowing to liberal pacifist sentiment. The argument behind this is to build the biggest possible ‘opposition’ to Bush and Blair. This strategy demands the building up of one demo after another. Even though the liberal forces have largely abandoned the streets for an occasional visit to the voting booth, the same tactics are pursued without questioning their continued usefulness. Demonstrations get smaller; but this isn’t compensated for by being more consciously anti-imperial and militant. Another worrying feature is the method the SWP uses to insulate itself from Left criticism. It sets up one party-front organisation after another – the Anti-Nazi League now mutated into the Anti-Fascist Alliance (better name, but no better politics), Globalise Resistance, and now the Campaign Against Climate Change. These are answerable only to the SWP’s Central Committee. The SSP was partly created to develop new democratic and non-sectarian ways for uniting the Left. Our party needs to make clear to the SWP that its bureaucratic and sectarian methods are not acceptable. SWP members should be quite capable of arguing their distinctive politics at democratically constituted meetings, and accepting united front principles when it comes to providing leadership for campaigns. At present, the SWP is still basking in George Galloway’s victory in the Bethnal Green seat at the last general election. However, Galloway’s misguided personal decision to participate in Big Brother highlights some likely future problems for the Respect alliance. At present, SWP hopes are mainly pinned on the forthcoming local elections in England. The SWP has failed to resolve the real political nature of Respect. Nor are there any democratic mechanisms in place to ensure the accountability of any potential councillors. Tensions have already emerged in Tower Hamlets in London over the SWP’s desire to have its leader, John Rees, adopted as a local council candidate. A substantial section of the local Bengali Muslim community wanted to put forward their own candidate. The SWP might want to promote Respect as an electoral front, which offers Old Labour politics and is also firmly opposed to Islamophobia. However, other forces, representing a reinvigorated political Islam, seek a new deal for Muslims in Britain – with better state funding for their religion, enforced bans on perceived ‘anti-Muslim’ activities (including books and plays) and their own schools. The SWP has got itself into a position of not being able to challenge this other political agenda, since to do so would be tantamount to ‘Islamophobia’! There is a marked parallel between the position of the new Muslim communities in Britain and the position of the largely Irish Catholic communities in Scotland, at the end of the nineteenth and beginning of the twentieth centuries. Socialists fought to win Irish Catholics to socialist politics, whilst Labourists accommodated themselves to the Catholic hierarchy, in order to win votes. In the process, the Catholic hierarchy achieved a relatively privileged position for itself in the Labour Party, effectively operating a veto over some progressive social policies. Any attempts to challenge this were met with, what amounted to, charges of ‘Catholicophobia’. The SWP seems to be currently pursuing the Labourist, not the socialist, path. Quite independently of the SWP, the SSP leadership has come to a somewhat similar conclusion with regards to ‘religious’ issues in Scotland. Religion is being more and more politicised by the Right (encouraged by New Labour). Yet faced with the continuation of state-funded Catholic schools, and now the possibility of state-funded Muslim schools, our party has remained almost silent in public. Socialists have long been committed to secular education, whilst championing the right of people to practice their religion without facing discrimination. We need to be far more vocal in upholding this policy, otherwise we give the religious Right a free rein, increasing the possibility of both sectarianism and racism. Difficult issues, such as opposing religious separatism, or defending those fighting for a democratic and secular, united Irish republic, can not be avoided. At present, our leadership seems to be concentrating on one particular strategy – defending the six seats we have in the Scottish Parliament. Yes, it would be good if we could achieve this. However, if such an attempt is made by lowering our political sights, and by ignoring or downplaying controversial issues which may alienate potential voters, then this is far too high a price to play. No easy recipe can be found to help the Left overcome recent setbacks. The fact that this is happening in much of Europe shows that there is a common underlying problem. Yes, the Left made considerable gains during the earlier anti-globalisation and antiwar protests. Yet, it proved relatively easy for the imperialist ruling classes to recapture much of their lost ground. It was much easier for the Left to oppose particular ruling class strategies and policies – neo-liberalism, privatisation, deregulation, or the Iraq war – than to offer a positive alternative. The statism and partyism, which formed the underlying basis for both the official Communist and Social Democratic versions of socialism up to 1989, has collapsed. There has not been a wholly coherent socialist alternative to replace this. Indeed much of the current Left’s thinking is still tied to aspects of the older models – state control and welfarism. This makes it relatively easy for the ruling class to recuperate aspects of some of these measures and appear more ‘liberal’, when under some pressure; or to denigrate them when they feel confident. A major job for the SSP is the education of a new generation of socialists. This means the SSP hasto provide a much better educational programme than at present for its members. We also need to begin a debate on what exactly we mean by ‘socialism’ – something which is quite distinct from Old Labourism or State Communism. Just trying to say we differ from the past models because we are ‘democratic’ is not very convincing. Social Democracy and early Communism made democratic claims too. We need to be able to outline a convincing democratic alternative, which offers the majority in society real control over all aspects of their lives – political, economic, social and cultural. We also need to be able to link this vision to a convincing contemporary process of political and economic transformation, rooted in today’s conditions. Republicanism and secularism today are two vital bridges to a future society. They also provide us with a viable alternative to challenge the ruling class’s current antidemocratic and socially divisive strategy. Dodging difficult issues, in the here and now, may enable us to win a few more short-term votes, but will not help us to develop a sound, longer-term base of support. It is far better to enter electoral contests with the primary aim of putting across more difficult, but principled, politics to a smaller number, in order to win active recruits to socialism, than to gain mainly passive voters for the SSP. Furthermore, ‘clever’ voting strategies, suggested either by Kevin Williamson or our Executive, are just as likely to backfire. If we convince voters that the SNP’s ‘independence referendum’ strategy offers the best way forwards, they are very likely to give both their votes to the SNP in 2007. We took quite a substantial vote from the SNP in the 2004 Scottish elections. John McAllion found this to his cost, when we stood down to give him a free run in the Dundee East seat! The winning of one-time SNP voters could provide us with a base for gaining more of their supporters to a specifically republican and socialist party, as the SNP continues its gallop rightwards. 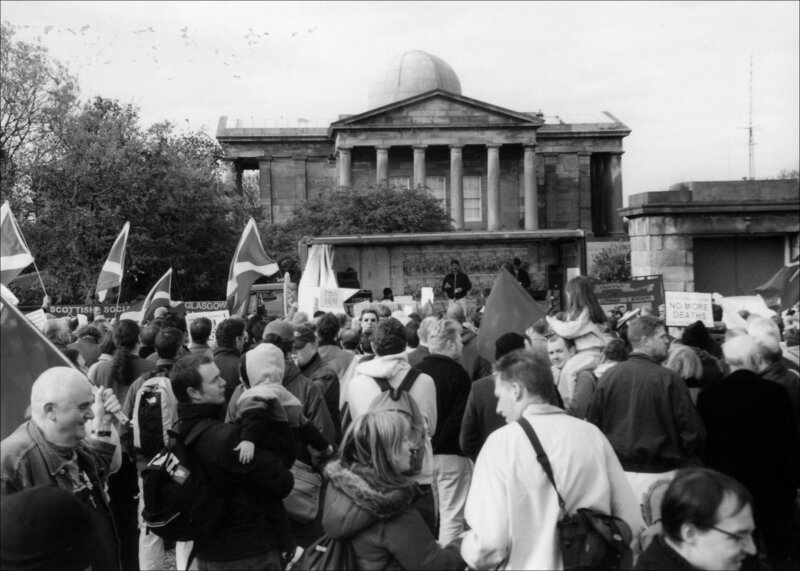 The Calton Hill Declaration and the demonstration on October 30th 2004 showed the possibilities. Now is not the time for the SSP to lose confidence in socialist politics or to abandon principles. There is a debate raging within the SSP which, like so many others, actually goes far beyond the superficial topic of the debate, and goes to the very essence of the nature of our party. The debate on whether or not to stand in first-past-the-post seats in the Holyrood elections, as well as in the list seats, is not simply about political tactics. It is about whether or not we are a nationalist party or a socialist party and what we see as the purpose of elections for socialist organisations. The debate will be had out at the 2006 SSP conference and will undoubtedly be acrimonious. It has angered many party members to see Kevin Williamson use his very privileged position, as a weekly columnist in the Scottish Socialist Voice , to argue against current party policy. He contends that we should not stand in first-past-thepost seats but we should also call on our supporters to vote for the Scottish Nationalist Party – a defender of capitalism and big business! He has been supported by Hugh Kerr, one time MEP and former party press officer. Although neither of them currently holds an elected position within the SSP, they are, however, representative of a trend within the party that views elections as important only if we can get someone elected or if they can aid the push towards independence for Scotland. Comrades should note that they do not differentiate between a socialist and a capitalist Scotland. Thus they are propelled forward to a quite logical position of voting for a party as devoid of principle as the Scottish National Party. Hugh Kerr argues, …You can’t vote Labour! Agreed Hugh but neither could I, or should I, vote SNP! Debates like this have gone on since the days when we set up the Scottish Socialist Alliance. At that time I remember arguing that we should offer a socialist alternative at every possible opportunity. No one talked about the SNP but were more concerned with not upsetting Good Labour Lefts . Ironically, in Dundee East at the last election, we did stand down in favour of good Labour left candidate, John McAllion and he lost his seat. This position was initiated by the Committee for a Workers’ International (CWI) platform in the SSP. Although RCN comrades did not agree with, and argued against this move, it was done as an exception rather than the rule. It was democratically decided by the branches with the full knowledge of the party nationally and was accepted by all comrades as the party position once the vote had been taken. I am sure the CWI comrades who pushed for this exception, will be totally against the executive’s proposals to turn the party’s position on its head and make this the norm. There are other principled exceptions we could cite such as standing down for Rose Gentle, the anti war campaigner whose son Gordon was killed in Iraq. However, what is now being proposed is far from a principled socialist position. It is being fought for by some who want to save the party money. Some who think it will increase our vote in the list – or second vote – and allow us more elected representatives (although no evidence of this being the case has so far been produced). And by some who really believe that tailing the SNP will somehow bring us to socialism. Anyone who believes that the SNP are on our side is sadly mistaken or wilfully nationalist. The SNP, where it has power in local government, are just as ruthless as those councils in Labour clutches. Look at how the SNP council in Perth and Kinross supported the G8 protests or ask the nursery nurses in Angus how the SNP dealt with them during their heroic strike! Although on the war, the SNP was to the left of Labour; for a nationalist party, it is distinctly of the more reactionary variety. We are not dealing with revolutionary nationalists who fight for national rights against the oppressor nation. We are dealing with a party which, through its firm adherence to capitalism, is complicit in the oppression of the working class. It is not a republican party and goes to great lengths to accommodate the monarchy and envisages a role for the crown in an independent Scotland! There was a recent stooshie when one of its MSPs called the union flag the butcher’s apron (widely accepted on the left as an effective metaphor for the blood shed thanks to imperialism). Very quickly retractions were made and blame for this perceived gaff, laid at the door of a party worker. Those members in the SNP who do share socialist tendencies, have to keep them firmly under wraps less they affect the respectable image of the party. It is firmly a capitalist party hoping to follow the Celtic Tiger of the Irish Republic. It has failed to support the SSP on getting rid of the council tax and demanding the right to march to Gleneagles against the G8 warmongers. In fact, the SNP helped ban the SSP MSPs from the parliament for a month after they staged a peaceful protest in the parliament. They thus denied our comrades and the party workers their wages for that month and they denied our elected representatives the right to participate in the democratic process. Why should we support them? Oh, because they want an independent capitalist Scotland! It is not good enough comrades. I have some sympathy with those who put forward the view that where we do not have a branch or members then it can be counter-productive to parachute candidates in then simply leave. Even then, this can be justified if the election can be used as a vehicle for building a branch. On the whole, however, these should be treated as exceptions and the local branch’s view should be allowed to prevail. The general position should be that we stand wherever possible in order to allow the working class of this country the opportunity to vote socialist at every opportunity. We fight the election arguing the case for socialist politics and if we get someone elected, then that is a welcomed bonus but is not the reason for standing. By pulling out of the first-past-the-post seats, we reduce our credibility in the eyes of the electorate and appear to be only interested in the fight to win the hearts and minds of a nation when there is payback for us in terms of seats. This does not differentiate us from the mainstream parties; it makes us just like them! The comrades, like Kevin Williamson, who argue we must vote in the first vote for an anti union candidate are elevating separation of Scotland above all other considerations. Independence First is not a socialist concept. A very long spoon is necessary to sup with the SNP and other reactionary elements that make up that particular coalition. The fight for independence must be integral to a socialist fight or it will lead us to exactly the same place as the Irish Republic: tied firmly to international capitalism! There have been many times throughout history where socialists have not stood and have responded in a principled fashion by setting up a series of minimum demands to put to candidates from other parties in order to decide, whether or not, to give them critical support. If the SSP adopts this retrograde position at conference, then at the very least we should follow in this tradition and not give blanket support to any capitalist party but demand of its individual candidates they support such a programme. These would then be formally put to all the candidates, standing in the seat. We would then publicise the responses of the candidates as part of our election campaign. We would urge our supporters to vote for only those candidates willing to publicly declare their support for this basic platform. This method, which has an honourable history within the socialist movement, gives us a way of supporting progressive candidates (if such exist) in any rival party and avoids giving blanket support to any other rival party. If no candidate in a particular seat is able to publicly and unequivocally support the platform, then we publicly call for an active boycott of the first-past-the-post election in that seat by writing socialist on the ballot paper. Only this approach is worthy of a socialist organisation. If we do otherwise in relation to the SNP then we have to question whether we are nationalist party or a socialist party. More than 5 years ago, on 7 May 2000, British troops landed in Freetown, the capital of Sierra Leone. This was the first major intervention by the British army in sub-Saharan Africa since the end of its bloody campaign in Kenya, in 1964. At the time, Blair’s government claimed that its only aim was to rescue British citizens whose lives were allegedly threatened by a rebel offensive against the capital. This pretext sounded rather hollow, however, in view of the many similar offensives which had already taken place since the beginning of the country’s decade long, on-going and brutal civil war. In fact, within days, Blair was explaining that the army would need to stay for at least a month, to facilitate the build-up of a UN peace-keeping contingent. Soon, however, this one-month mission was extended to a 9-month, during which the British contingent became actively involved in the war, under the pretext of ‘helping’ UN troops to disarm the rebels. Two years later, when the new rulers, brought to power by London, declared the civil war officially over – whatever this really meant on the ground – a British contingent was still there. And far from pulling out, part of it stayed on, this time on an open-ended mission, ostensibly aimed at training a new Sierra Leonean police force and army. Five years on, the British forces are still in Sierra Leone. Officially, Britain is now only providing advisors and ‘army trainers’. 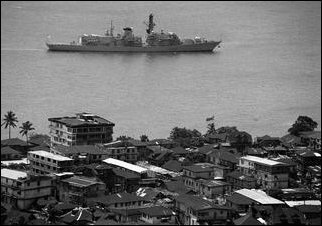 But their real function is certainly better reflected by the fully manned British warships which are constantly anchored off Freetown’s shores, ready to fulfil Britain’s commitment to deploy its forces within 48 hours, if needed. Blair, who boasts of have restored ‘peace and democracy’ in Sierra Leone, has never bothered to explain why such an idyllic state of affairs should require a heavily armed task force on the ready. Obviously, just like in Iraq, the interests of imperialism in general and British capital in particular have something to do with it. 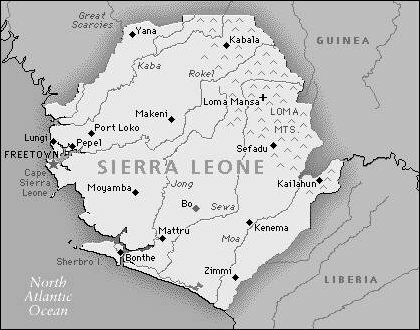 While thanks to Blair’s military venture, western companies are in a better position today to take the lion’s share of the country’s natural resources, the population of Sierra Leone has gained nothing – except the right to return to the ruins of a country devastated by the civil war and to slide even further into poverty as a result of the systematic looting of the country by imperialism. It should be recalled that civil war in Sierra Leone began in 1991. As is often the case in sub-Saharan Africa, because of the artificial nature of the national borders inherited from the colonial days, this war started as an offshoot of another civil war, which had been fought on and off in neighbouring Liberia, for more than 8 years. As in Liberia, the cause of the civil war in Sierra Leone was a combination of three factors: the catastrophic slide of the population into poverty since the mid-1970s, the collapse of the corrupted western-backed cliques in power and the resulting implosion of the state machinery itself, particularly of its backbone, the army. During the total 11 years of civil war in Sierra Leone, the capital, Freetown, changed hands no less than nine times – and each time, so did the nominal rulers of the country. At its peak, the war involved 4 main local armed factions. Two of these factions – the Revolutionary United Front (RUF) and the Armed Forces Revolutionary Council (AFRC) – had been set up by young nationalists and former army officers in an attempt to bid for power. Another faction was the rump of the regular army, although it was itself divided into many rival sub-factions, as many unit commanders tended to have their own agendas. The fourth faction, the so-called Kamajors, was a British-backed tribal militia. This war also involved a large number of ‘official’ foreign troops. The first foreign contingent to intervene, in the early 1990s, was the Nigerian-led ECOMOG, a multinational force originally set up under western pressure by the Economic Community of West African States, to intervene in the Liberian civil war. However, throughout the war, acting more or less behind the scenes, under the auspices of the western powers, were small armies of highly-trained, heavily-armed mercenaries, provided by organisations such as the British based Sandline and the South-African-based Executive Outcomes. 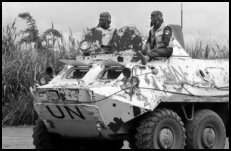 With the intervention of the British army in 2000 and the subsequent build-up of the UN’s 17,500-strong UNAMSIL contingent, the total number of more or less independent protagonists in the war rose to seven, not counting the various mercenary outfits. Predictably, apart from Freetown itself, much of the war was fought over who would control the country’s main natural resources – its diamond fields and rutile mines (Sierra Leone has the world’s largest known deposits of this mineral, from which titanium is derived, and used in the manufacture of paint and special alloys). For the Sierra Leonean population, the particular uniforms worn by the soldiers did not make all that much difference. All these forces behaved in the same way, with the same aim – to terrorise the population into backing them. The foreign troops had aircraft and helicopters, whereas the local factions did not. The former avoided direct contact with the population, whereas the latter systematically forced young boys to join their ranks. But ECOMOG’s rifles and incendiary grenades or the anti-personnel bombs of the British and the mercenaries, caused as many casualties among the villagers as the machetes of the local factions. By 1996, taking opportunity of another coup led by a general who was willing to toe the western line, the western powers pushed forward their own chosen strongman. This was Ahmed Tejan Kabbah, a seasoned politician and former UN official. In 1996, during a relative respite in the war, a presidential election was organised at Britain’s behest and Kabbah was elected. This election was a farce, as large parts of the country were held by the rebel factions and did not take part in the vote, while 25% of the population had taken refuge in neighbouring Guinea. Nevertheless it allowed the western leaders to portray Kabbah as a ‘democratically elected leader’ and to provide him and his Kamajors militia with their political and military support. However Kabbah had no real basis of support among the population, let alone among the remaining ‘official’ Sierra Leonean army. He was soon overthrown by a military coup and forced into exile. And his two subsequent attempts to resume his position in Freetown met with the same failure to restore some order in the country, despite the protection of ECOMOG, the Kamajors, the various mercenary forces as well as the first contingent of ‘peace-keepers’ sent by the UN. It was this failure to maintain Kabbah in power which prompted Blair to send the troops in 2000 – all the more so as, the last thing he wanted, of course, was to leave the country, which was after all part of the traditional backyard of British capital, in the hands of a US-dominated UN! In fact British ‘advisors’ had been occupying every level of Freetown’s administration – from the military to revenue and finance – since Kabbah’s second return, in 1998, with Keith Biddle, formerly of the Greater Manchester and Kent police forces even acting commander of the Sierra Leone Police. Hardly surprising that many commentators now claimed that Britain was resuming colonial control of the country. Finally, after a new agreement was signed with the various factions, a second ballot was held in 2002 in which Kabbah was ‘re-elected’ by a ‘landslide’ in ‘free and fair elections’, even if much of the population was still in refugee camps or internally displaced and unable to register to vote. Today, the war is said to be over. The UN troops have been reduced to 3,000 and are due to leave the country by the end of this year – although no date is set for the departure of the British task force. But has ‘normal life’ been even partially restored by this huge outside intervention? What about the 50,000-200,000 victims of the war (nobody really knows how many) out of a population of less than 6m? What about the barbaric mutilation suffered by civilians as a result of rebel factions’ ‘special’ punishment, which took the form of amputations of their hands, feet, arms and legs? Do these victims all now have artificial limbs and medical care, or even schools, hospitals, roads, water, electricity? Do they all have homes to live in? Statistics show that today, 70% of the country’s population are living in extreme poverty. That average life expectancy is 37 years, supposedly up from 34 years in 2003; infant mortality is 70 times higher than in Britain. Only 36% of the population can read and write yet still only 40% of children attend school. 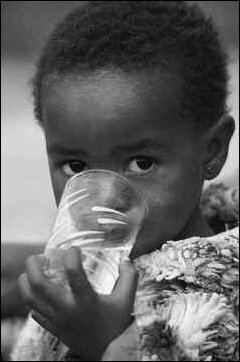 Only half the population has access to clean drinking water, etc. In fact, after having been ranked as the world’s poorest country (177th rank) for seven years in a row by the UN, Sierra Leone has managed to climb to 176th rank this year, but only as a result of Niger’s acute famine crisis! 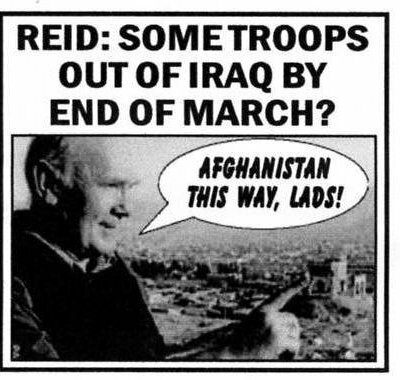 Such is the great ‘success’ achieved by Blair’s on-going military intervention. But even this is only part of the picture. The truth is that the entire country, with most of its infrastructure, has been destroyed and nothing is done about it. What Blair means by restoring ‘peace and democracy’ in Sierra Leone certainly does not include making plans to meet the needs of the population, let alone implementing them – British imperialism has only contempt for the masses, whether in Sierra Leone or in Iraq. Electricity supply provides a graphic illustration of this. There are only three places in the whole of Sierra Leone which get 24-hour electricity, all in and around Freetown: the government’s complex, the British army compound and UNAMSIL-ville, the UN compound. As to ordinary households, they are lucky if they get electricity one hour per week! Nevertheless, they do receive electricity bills. And the National Power Authority actually increased charges for the second time this year in October, by 30%, without first notifying anyone! The problem is that the infrastructure managed by the National Power Authority is in a near terminal state, despite cash injections from donor states, like $10m from South Africa. Freetown’s only oil power station cannot even provide half the capital’s requirement, in spite of recent upgrading. And then, there is the state of disrepair of the distribution network, resulting in massive energy losses. The power supply problem is to be solved however, but not quite yet! The World Bank only approved a grant of $12.5m in June this year to finance the Bumbuna Hydroelectric Project, intended to supply Freetown, in particular. So, although this project was originally meant to be completed by October 2005, construction will only start next year. In the meantime, the South African state power utility, Eskom Holdings, is in talks to take over management of the National Power Authority, undertake refurbishment and provide technical support – but this will not come for free for consumers, of course. To make up for the erratic supply of electricity, the people who can afford it, buy little generators – known ironically as ‘Kabbah Tigers’ – which cost 160,000 leones, or around £32 (£1=5,000 leones). But the ‘legal’ (if this means anything) monthly minimum wage is £7.50! Which will not buy a sack of (imported) rice! So even owning an inefficient ‘Kabbah Tiger’, worth the equivalent of nearly 5 months wages, is the privilege of the relatively ‘rich’, just as buying the low-grade fuel used to power these generators as well as all vehicles, at around £2/litre from mostly illegal suppliers over the Guinea border. The country’s road network is another case of total disregard for the needs of the population. Whole sections of roads are still destroyed, having been blown up during the war, or, simply, for lack of repairs for over a decade. As a result, agricultural products from the rural areas cannot reach the capital where they are need. While food prices are going through the roof in Freetown, threatening the poorest with starvation, rural farmers can hardly scrape a living. But there is no question of using the Navy’s idle heavy-duty helicopters to carry food supplies into the capital until the roads arerepaired, nor has the Royal Engineer Corps been mobilised to repair these roads! Freetown residents are at present working towards setting up a Special Court to try all those who bear greatest responsibility in keeping the city filthy. Those whose efforts have brought the battalion of flies and mosquitoes to inflict mayhem will be tried come 2007 when the court starts sitting. This being an allusion to the UN Special Court meant to prosecute those bearing ‘greatest responsibility’ for war crimes – and to the coming elections in 2007, when the population will have a chance to pass its judgement on the present regime. Meanwhile, in Freetown, an army of expensive 4x4s, driven by UN, NGO or British personnel, are pushing their way to the front of the queues of the local mostly unroadworthy vehicles and flaunting their privilege by raising clouds of dust in the faces of the majority who have to walk everywhere they go, not always on two feet and certainly without shoes. However, UN and British forces do contribute in their own way, to the ‘rebuilding’ of the capital by generating a flourishing ‘industry’ – prostitution – to which many young women resort for lack of any other means to survive. So far, this ‘industry’ has resulted in numerous extremely nasty scandals, as a consequence of the way in which successive units of soldiers from all over the world have regularly sexually exploited vulnerable and impoverished women and girls. Strangely enough, even though £20m was allocated by the UN towards HIV/Aids projects, there are no statistics as to the incidence of infection – although it is thought to be around 7% of the population. Which merely reflects the fact that there is nothing which even vaguely resembles an organised health care sector. Of course, UNAMSIL has been forced to recognise its corrupting influence. It recently launched a project dubbed ‘girls off the street’ to cut down the rate of prostitution. The project aims to train these girls as commercial transport drivers and motorcycle riders to ‘transport goods and persons’ around the country. However, the UN’s contribution exposed the cynicism of its alleged goodwill: two taxis, some motorbikes and around 2m leones which is equivalent to around £438!! It is not just women who are being exploited under Blair’s occupation of Sierra Leone, children are as well. Of course, child labour is a common feature in most poor countries. But it reaches an extreme in the streets of Freetown, where little children, bare-footed, sickly, and in rags, try desperately to sell a handful of nuts, fruit or corn, or a carefully tied plastic bag of water, origins unknown – because access to drinkable water is another unresolved problem. Other small children who cannot be more than ten years old sit by the roadside, armed with hammers, breaking large pieces of granite into smaller pieces. This child labour is, among other things, an essential contribution to Freetown’s ‘booming’ building industry! These children must load the broken gravel into baskets and strain their puny neck muscles to carry this weight on their heads to the sites where higgledy-piggledy housing is being erected – without any regulation – because access is by foot only, for lack of a proper road. Three years after the war was declared over, many houses still stand in ruins, shelled, burnt, marked by gunfire, in any case in bad need of refurbishment, if not complete reconstruction. But the construction work which is being done is not for the poor population. This construction is largely being undertaken by Chinese companies, with a boldness to jump in where other countries fear to tread as the British Financial Times remarked upon in their survey of Sierra Leone published in February this year. For instance there is the refurbishment by the Beijing Urban Construction Group of the 60,000-seat national stadium complex, the government complex and the army headquarters… One should also mention the 11-acre Bintumani Hotel site, where a ‘Chinese themed’ upgrading continues (on a 25-year lease signed with the government) which includes the construction of a big casino. Another 250-bed luxury hotel complex and conference centre is to be built according to an agreement signed with the Sierra Leone National Tourist Board, in May 2004, as well as a sports stadium in the southern provincial capital of Bo – ‘spectacular’ buildings which will do nothing to solve the housing crisis for the poor. Last June, the UN’s Special Court started trials for those accused of war crimes – supposedly, those who bear ‘the greatest responsibility’ for organising atrocities since 1996. Only 13 people were indicted. But, among them, 2 are already dead, one is missing and another, the Liberian warlord Charles Taylor, has been given political asylum in Nigeria. So only 9 accused will be put on trial. Yet this Special Court has managed to spend $81m in 3 years, much to the disgust of a destitute population, when such funds could have been spend on clean water, housing, health care, etc…! Ironically, one of the first accused to stand in the dock was not a rebel faction leader, but a member of Kabbah’s government, who was indicted as co-ordinator of the pro-Kabbah Kamajors militia. Needless to say, this helped make the Court’s American chief prosecutor extremely unpopular with the regime and he has now decided to stand down. But then, of course, this court, like similar tribunals in Rwanda, is primarily there as a fig leaf aimed at putting all the blame on just a few individuals, while deflecting scrutiny from those in power. The parallel South African style ‘Truth and Reconciliation Commission’ has a complementary purpose. It grants amnesty to the accused in return for a ‘confession of guilt’, thereby, no doubt, allowing these individuals to be recycled into respectable figures who can then be co-opted by the regime, regardless of their past crimes. This legal charade is all the more cynical because, at the same timeas these sanctimonious proceedings are progressing, the country is sliding into a corruption swamp, despite the appointment of various anti-corruption bodies. Corruption is legendary in Sierra Leone, as it is in so many poor countries. Today’s British-backed regime is no exception. With diamonds and other attractive minerals involved, there is huge scope for personal gain, including from the granting of mining and prospecting licences. According to a twice weekly local publication called Peep! which exposes misuses of power, Things have gone from bad to worse, ironically since the Anti Corruption Commission has started! This is confirmed by the executive director of the ‘National Accountability Group’ who is quoted as saying: If you’re put in a government office and you don’t steal, your whole family gets angry with you . And the conspicuous wealth flaunted by government officials, which is certainly not commensurate with their salaries, is even more sickening in the context of this devastated country. However, exposing the reality of corruption is a dangerous thing to do under president Kabbah. Actions against journalists have been going on for some time. In 2002, the daily African Champion Newspaper was shut down for 2 months and its editor banned from journalism for 6 months, for accusing Kabbah’s son of corruption and claiming he was protected by his father. The same year, Paul Kamara, editor of the newspaper For Di People was jailed for 2 months and his paper banned for 6 months for calling an Appeal Court Judge a swindler. Last year, Paul Kamara, again, was given a 4-year jail sentence for slandering the president. 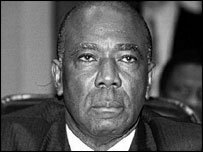 He had claimed that Kabbah should not have been allowed to stand for president, since his name had never been cleared of a fraud scandal, which took place in the late 1960s, when he was permanent secretary at the trade ministry. Far worse even, the acting editor of For Di People , Harry Yansaneh, was beaten up in July this year by thugs allegedly acting on the orders of a ruling party MP. He later died of his injuries. His murderers were found guilty of homicide, but were then somehow freed on bail. So much for Kabbah’s Blair sponsored ‘democracy’! As in most poor countries, the only game in town for the regime is to attract foreign investment. So, despite the county’s general economic bankruptcy and deprivation, Kabbah relaunched the privatisation drive interrupted by the war. Plans have been drawn up to sell off 24 state-controlled companies, including finance, transport, utilities and commerce. The target for completion, originally 2006, is now 2010, while the Commission in charge of the job complains that it would require at least $12.5m in ‘sweeteners’ in order to attract buyers. As a result, the only candidate for privatisation, so far, is the Rokel Commercial Bank – which was formerly owned by Barclays, until it sold it to the government for a nominal £1, in 1998. But since this bank was put up for sale in December 2004, there have not been any takers. To make the country even more attractive to potential ‘investors’, the Sierra Leone Export Development and Investment Corporations, shortened to a catchy ‘Sledic’, offers them a 7 day fast track registration. Foreign companies are offered an attractive package devised with the help of the World Bank. For instance, investors in large-scale agriculture get a 10 year exemption from the standard corporate tax rate of 35%, with no minimum capital requirements. Besides, materials required for ‘tourism businesses’ and equipment for mining operations are duty-free. As for agriculture – this is a Kabbah’s big headache, since he promised that every single person in the country would have enough to eat by 2007. He has since qualified this by saying he had not meant that he personally was taking responsibility for feeding everyone! Just as well, since the initiative to prop up cash crops like coffee and cocoa, is certainly not going to feed anyone at all. That said, rice production, in which Sierra Leone used to be self- sufficient, is supposed to be improving. The really big business, of course, is in rutile and diamonds. Rutile used to be the country’s biggest export earner before the civil war – although no-one knew for sure, since an unknown part of the diamond production was smuggled out of the country – and the Sierra Rutile Limited used to be the country’s largest employer. Today, all of Sierra Leone’s rutile operations, together with its smaller bauxite resources, have been regrouped into the Titanium Resources Group, a London-listed company, controlled by a very shadowy business character -Jean Raymond Boulle, a British citizen based in the French tax haven of Monaco. Boulle’s name has been associated, one way or another, with just about every recent African civil war in which mining resources were at stake – such as Angola and Congo-Zaïre, for instance. Under Boulle’s auspices, Sierra Leone’s rutile mines were reopened officially at the beginning of November, thanks to EU and US loans. Full production should resume later this year. As to diamonds, last year’s outputreached 32% of the 2m carats which used to be produced annually in the 1960s. While small scale digging of the alluvial diamond deposits has resumed, Koidu Holdings is the only ‘industrial scale’ diamond mining operation exploiting the Kono diamond fields in the north east at present. In fact, Koidu Holdings is just a front controlled by what was formerly Branch Energy, the British-based company linked to the mercenary outfits, Executive Outcomes and Sandline. Jan Joubert, the South African chief executive of Koidu Holdings, admits himself that, together with some of his staff, he used to work for Executive Outcomes. It seems that in exchange for the ‘services’ provided by the mercenaries to the Kabbah regime, the 25-year lease obtained for the Koidu area as well as exploration licences for gold and diamonds elsewhere are finally bearing a lot of ripe fruit for these soldiers of fortune and their corporate sponsors. There are still others are in the diamond game. The British-Canadian company Mano River Resources is said to be close to entering a joint venture with mining giant BHP-Billiton to blast out diamonds in Kono. In addition, the Sierra Leone Diamond Company claims to have 20 mineral prospecting and exploitation licences for the entire northern third of the country covering a total area of 36,365 square kilometres. This company has an address in London’s Berkeley Square, is registered in Bermuda and is controlled by another shadowy businessman – Vasile (Frank) Timis who has been accused of all kinds of nefarious dealings to do with Regal Petroleum and mining operations in his native Romania. However, behind the (relatively) small players of the diamond industries, the real big beneficiary remains De Beers, simply because of its 50% control of the diamond market. The rutile and diamond industries are usually hailed by all and sundry as the future for Sierra Leone. However, not only do they provide no benefit whatsoever to the Sierra Leonean population (except for the handful of local capitalists and politicians), but they are a real calamity for the population of the large areas concerned. In the case of rutile, for instance, the mineral is mined by ‘dredging’ – i.e. by flooding large areas with artificial lakes and extracting the mineral from these lakes. And the regime connives with the companies to confiscate the lands of local farmers who are left without any compensation. This is probably why the Boulle’s company is officially allowed to maintain a heavily-armed, uniformed private army to guard its operations… against the population! In the case of diamonds, the 4,500 people who live close to the Koidu kimberlite pipe that Koidu Holdings started blasting two years ago, have to evacuate their homes whenever blasting is taking place. But to date, they have still not been offered resettlement (only 10 substandard, incomplete houses have been built without any facilities), Sierra Leone despite a 2-year long campaign against this company’s destruction of their environment and disruption of their farming activity and their lives. Which is no surprise, of course. So what is the balance sheet today for the population after 5 years of British intervention and 3 years of ‘peace’ in Sierra Leone? What do Sierra Leoneans have the British government and the UN to thank for? It is hard to avoid parallels with Iraq under occupation and particularly the occupation of southern Iraq by the British. Kabbah’s regime would certainly not have come to power nor survived until this date without the western intervention and the continuous presence of British troops. Nor would it have any chance to remain in power for any length of time without the 9,000 plus police trained by the UN and equipped jointly by the UN and Britain, or without the new Sierra Leonean army trained and equipped by Britain. Even then, the ‘peace’ – meaning only political stability at the top – is far from guaranteed. While over the past 3 years there has been no visible sign of a significant-scale armed rebellion, there has been at least one unsuccessful attempt by armed men to break into an armoury in Freetown. And it is probably not for nothing that the new British-trained army chief of staff felt it necessary to tell his officers just this October that they had better stay out of politics, forget their tribal loyalties and where they come from, or resign. Obviously, coups by disgruntled or ambitious army officers are far too common an occurrence for anything to be taken for granted. Whether the present status quo will be maintained is an open question, especially given the instability of the whole region. After all, nearby Ivory Coast is in turmoil and the recent election in neighbouring Liberia may well only conceal an on-going stand-off between rival armed factions. As to Kabbah’s regime, after only 3 years of existence, it already has all the features of the old corrupt dictatorships of the past. This does not stop Blair from boasting of having brought ‘peace and democracy’ to Sierra Leone, just as US leaders claim forneighbouring Liberia. Never mind the fact that behind the thin veil of ‘institutional democracy’ lies an institutionalised corruption backed by repressive methods. Never mind either, the acute deprivation of the population and the total collapse of the country’s social and structural fabric. The truth is that the endemic poverty which was the breeding ground on which the civil war of the 1990s fed, still prevails. Only now, it is compounded by the hatred generated and suffering caused by the war among the population. But why should that bother Blair and the other imperialist leaders as long as a western-backed regime manages to impose just enough political stability to allow imperialist companies to loot the country’s resources? Until, that is, the day that the very same factors produce another catastrophe. Philip Stott, member of the SSP and the Committee for a Workers’ International (CWI) gives his analysis of the Scottish Independence Convention and the trajectory of the SSP. It’s been more than a decade and a half since the soothsayers of capitalism pronounced the triumph of the market and read the last rites for socialism. Events since then have not worked out as well as the free-market ideologues had initially hoped. Neo-liberal policies and capitalist globalisation – the twin hatchets that the capitalist class internationally have used to slash away at workers’ rights and the social conditions of the majority of the world’s population – have produced mass opposition in its wake. The deepening social revolt in Latin America, the first continent to suffer the laboratory experiment of neo-liberalism and privatisation has shaken imperialism. While not yet carrying through a socialist revolution, events in Venezuela, Bolivia and other countries underline a growing tide of revolt against capitalist policies internationally. The so-called developed west has seen the emergence of important class battles in Europe on pensions, jobs, wages and attacks on working conditions. This has provoked major strike movements in Belgium, Italy, Ireland and Greece in the last few months. US imperialism, the colossus who bestrode the world unchallenged, has been exposed as having feet of clay. Bush’s hopes following the Iraq invasion, a reliable source of cheap oil and a strengthened hand for imperialism’s policies in the Middle East, are sinking into the quagmire. Iraq is becoming a nightmare for imperialism with no exit strategy. There is a majority inside the US now opposed to Bush’s strategy. While in Iraq the horrors of the occupation and the policies of the US and UK has led to tens of thousands of Iraqi deaths and a developing civil war with incalculable consequences for Iraq and the entire region. The weakening position for imperialism and their allies in the Middle East was also underlined by the election victory for Hamas in the West Bank and Gaza recently. As well as building our own revolutionary Marxist forces, the CWI has advocated the need to build new mass parties of the working class as an important step to challenging the neo-liberal offensive. Even where these parties don’t adopt initially a clear socialist and internationalist programme they would represent a step forward. This is also the approach we have taken towards the SSP in Scotland. We were founding members off the SSP in 1998 and have worked to build the party since then, while arguing for an alternative political strategy and programme to that of the SSP leadership. We believe there are big possibilities in Scotland to reach a new generation with socialist ideas and the SSP has the potential to do that. 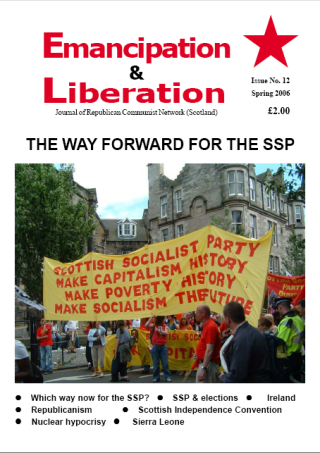 Our differences with the SSP leadership, a number of whom including Tommy Sheridan and Alan McCombes formally broke with the CWI in 2001, were over their rejection of the need to defend and build support for a Marxist programme while building the politically broader SSP. Their break from the policies and methods of the CWI has also led to political mistakes which are jeopardising the very future of the SSP. The enforced resignation of Tommy Sheridan as national convenor by the SSP Executive Committee was the catalyst for a crisis that has done severe and possibly lasting damage to the SSP. But it is important to understand that these events were a reflection of a fundamentally mistaken political approach by the party leadership to the tasks of building a mass socialist party; above all how, and on what programme, is a new party to be built and sustained. This mistaken approach is continuing and can further weaken the SSP unless a political change of direction is undertaken and rapidly. In our view the SSP leadership completely mis-judged the public impact that Tommy Sheridan’s resignation would have on the fortunes of the SSP. This was a reflection of a lack of an appreciation of the public standing Tommy Sheridan had, and still has, and the way in which his role in the mass struggles like the poll tax (when he was a member of the CWI) and since then played a decisive role in laying the basis of support for what was to become the SSP. Even more seriously, in our view, it exposes a leadership, or sections of the leadership of the SSP, that has lost its ability to connect with the working class. The CWI has fundamental political differences with Tommy Sheridan. In fact we were the only platform to challenge, in the form of a motion to the SSP National Council, Tommy Sheridan’s support for the mixed economy during the 2003 general election campaign. While Tommy Sheridan was arguing there was no need to nationalise companies like Tesco, the CWI counter posed the need to bring the multinational companies into public ownership under democratic working class control and management to form the basis of a planned socialist economy. We have also opposed Tommy Sheridan and others in the leadership of the SSP on their increasing turn to left nationalism. 1. What was proposed was a parliamentary bloc between the SSP, the SNP and the Greens. There would be virtually no independent working class forces involved which would mean the SSP would be locked into a campaign dominated by pro-capitalist forces. 2. Support for independence has dipped significantly since the formation of the Scottish parliament and there would be little popular support for such an initiative at this stage. preparing to submerge the political banner of the SSP into a pro-independence front that would promote the benefits of [capitalist] independence . Quote from original draft of SSP EC statement proposing the launch of the convention. These warnings have proved to be accurate. Since then we have had the launch of the Convention at a meeting overwhelmingly dominated by the members and supporters of the SSP, Greens and particularly the SNP; but with virtually no independent working class representation. The SSP EC described the launch meeting of the convention as having: “confirmed that the independence movement in Scotland is overwhelmingly antiwar; opposed to nuclear weapons; concerned about global and domestic inequality of wealth; and in favour of a diverse, multicultural Scotland where asylum seekers are welcome.” (SSP EC motion to 2006 conference) is a clear warning of the direction they are proposing to take the SSP. To describe the independence movement and therefore the SNP as reflecting these aims is wrong in fact and in principle. The SNP are staunchly pro-capitalist, for cuts in corporation and business rates and wish to model the Scottish economy on the Celtic Tiger where Irish and migrant workers are facing a neo-liberal onslaught on wages and conditions. Just a few days after the convention’s launch, Alex Salmond attacked Gordon Brown for levying a windfall tax on oil profits, claiming it would cost Scottish jobs and weaken the Scottish economy . So concerned are they about inequality of wealth that they want to implement policies that would further widen the gap between the rich and the rest. The anti-war SNP also supports troops from Muslim countries taking over from the current US/UK occupation of Iraq. What the EC’s position does illustrate is a conscious attempt to politically minimise the differences between the pro-independence forces . If this goes unchallenged it will increasingly see the SSP tail-end the SNP. Already there are vocal demands from some SSP members calling on the SSP to back the SNP in the 2007 constituency elections for the Scottish parliament. Given the political trajectory of the SSP leadership over the last couple of years this is actually a logical proposal; as is a post-election coalition between the SSP and the SNP. It would be difficult to overstate the damage this can do to the SSP. The SNP are seen by big sections of the working class as part of the same political establishment as New Labour. The advances made by the SSP between 1999 and 2003 were precisely based on the fact that the party was seen as an alternative to the pro-business political establishment. The SNP have lost support in the last four elections – reflecting the softening of the mood on the national question in Scotland and their move to the right politically. The profile of the SSP as a fighting, class based anti-capitalist and socialist alternative to the business parties has been diluted by the turn towards the SNP and left nationalism and can potentially prove fatal for the SSP if not halted. No account is taken by the SSP EC of the limited backing that independence has among the Scottish population at this stage. While any union has to be voluntary, and the UK state does not fall into that category, separation must also be a voluntary measure – with the active support of a majority of the population. That is not the case at the moment. The idea of the convention offering a fast, broad highway towards independence (Alan McCombes, Scottish Socialist Voice No 182) is a complete illusion. There is no fast highway to independence. There will be ferocious opposition to the break up of the UK from British and Scottish big business reflecting their class interests at this stage. There are alsosignificant doubts, and even opposition, among sections of the working class to the idea of an independent capitalist Scotland being an advance. A capitalist Scotland that under the SNP would continue the brutal attacks on workers’ rights as in Ireland and increasingly in Norway, Denmark and other nation states served up as economic models by the SNP. Under these conditions the road to independence is likely to involve many twists, turns and setbacks. The CWI in no way rules out a re-emergence of a strong mood, and at some stage possible mass support for independence in Scotland. We support the demand for a referendum on independence as a democratic right. We have consistently supported and fought, for decades, for the democratic rights of the Scottish people, including the right to an independent state where a majority support it. But it is essential that socialists explain, as the CWI has done, that only a policy based on the need to break completely with capitalism can a solution to poverty and inequality be found. That is why we support the founding programme of the SSP which called for an independent socialist Scotland which we believe should form part of a voluntary and democratic confederation of socialist states alongside England, Wales and Ireland as part of a socialist Europe. 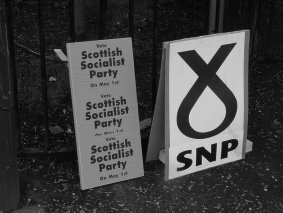 The building of a more powerful force for socialism in Scotland requires an unambiguous, ideological struggle against the ideas of the SNP today and the possibility of the emergence of left nationalism as a mass force in the future. To their discredit the SSP leadership are doing the opposite and are in the process of politically disarming the SSP of its socialist and class based ideas. This in turn will weaken the ability of the SSP to counter the radical, semi-anti capitalist ideas of left nationalism that don’t propose to go beyond the framework of capitalism. Instead there is a danger the SSP can become the champions of these ideas if the current political approach of the leadership does not change. This consistent and principled opposition by the CWI platform towards the SSP leadership’s turn to left nationalism has not been shared by the RCN platform. On the contrary, the RCN welcomed with open arms the Declaration of Calton Hill . The RCN in their journal, Emancipation & Liberation No. 7 , prepared for the 2005 SSP conference stated: FULL MARKS FOR REPUBLICAN INITIATIVE . They even went on to call on the SSP: to advance the party’s other initiative, the Scottish Independence Convention, on sound republican principles . As we have explained in this article the Convention proposal from the SSP EC represented not a turn to the left but a turning away from a principled socialist and Marxist position. There are many ideas contained in the declaration that could be supported; an end to poverty and a redistribution of wealth; the removal of nuclear weapons; the abolition of the monarchy; an end to racism and oppression etc. But the declaration was constructed in such a way that the entire emphasis of the document was that an independent Scottish republic could achieve these goals. There was no mention of socialism in the declaration and as a result the danger is that it will promote illusions in what can be achieved in an independent capitalist republic. It should not be forgotten that the USA is a republic, and has a written constitution, as is France, but because they are based on the class rule of a capitalist elite the majority of their populations are consigned to a life of struggle and insecurity. It was therefore wrong of the SSP leadership to draw up a document that consciously omitted any reference to the need to stand for socialism. Events in both France and the US since then have underlined this approach a thousand times over. The continuing programme of attacks on French workers being carried out by the Chirac – de Villepin government, the recent riots – fuelled by poverty discrimination and racism – of the most downtrodden sections of French society underlined that a republic, even one based on equality and liberty , would not fundamentally alter the class character of the state. The RCN might wish to ponder the fact that the French government introduced emergency powers, including curfews, the powers of mass arrest and other draconian measures during the riots. These repressive powers were available to them despite the lack of Crown Powers and other feudal remnants. Similarly, in the US the occupation of Iraq and numerous wars and police actions have been sanctioned by a republic and one with a written constitution no less. Let’s recall that the Calton Hill declaration commented: We believe that a written Constitution will guarantee, under law, everyone’s right to freely vote, speak and assemble; and will guarantee the people’s right to privacy and protection, and access to information on all its Government’s doings . In practice it would do nothing of the sort. The US Patriot Act, and an arsenal of repressive legislation, has been enacted in the US as part of the war on terror , despite a constitution. 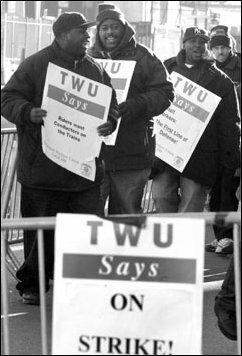 The December 2005 New York transit strike saw workers fined two day’s pay for every day they went on strike and their union fined $1 million per day as a result of the anti-union laws. For the SSP leadership, with the RCN’s fulsome backing, to draft such a declaration was a mistake and can only reinforce illusions in what would be possible in an independent Scottish capitalist republic. that socialists and Marxists should reject the fight for democratic rights as an unimportant issue? The CWI and the parties affiliated to it have a long record off opposing anti-democratic legislation. From the Criminal Justice Act to ID cards and other anti-terror and anti-immigrant legislation to fighting for the repeal of anti-union laws, to opposing repressive measures against the Catholic population in Northern Ireland. Internationally, sections of the CWI in Pakistan, Chile, Nigeria, South Africa, Sri Lanka among others have worked under brutal military dictatorships or semi-Bonapartist regimes, where the struggle for the most basic of democratic rights like the right to vote, organise free trade unions, the right to carry out any political activity etc did not exist. This meant that the demand for basic democratic rights have formed an essential part of our day-day fighting programme, while emphasising the need for mass mobilisations to win democratic concessions from the ruling elites. The Crown Powers provide the British ruling class with a constitutional sanction to go about their affairs, in whatever manner they deem necessary. They provided cover for the Iraq war preparations, long before the Westminster vote. The same Crown Powers are used to give backing to the massive encroachment on our civil rights represented by shoot-to-kill, gagging the BBC, dawn raids on ‘failed’ asylum seekers’ families, and turning an official blind-eye to US ‘extraordinary rendition’ flights landing in Scotland. Let’s imagine for a minute that the British state did not have a monarchy or Crown powers, like say the US or France. Would it still be possible for the British government backed by the ruling class to go to war? To attack asylum seekers and curtail the freedom of the press? 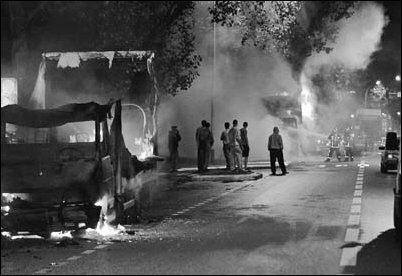 Not only would these attacks continue but they would inevitably happen because the capitalists are forced onto the offensive against the rights of the working and middle class; to attack the democratic rights of the population particularly in a period of economic decline and an increasing challenge to their rule by the working class they exploit. The ability to defeat these attacks and to prevent imperialist wars depends on the action of the working class and the poor internationally. But real independence, real democracy, requires a complete break with capitalism and the building of a democratic socialist society. Why limit a struggle for political independence and real democracy to only abolishing the feudal elements of the British or possible future independent Scottish capitalist state? Why not deal with root of the problem i.e. capitalism? The RCN are guilty of arguing that if only we at least had a Scottish republic we would then have the democratic freedoms to advance the struggle for socialism. Why is it not possible to build support for socialism now? Inherent in the RCN’s approach is the idea that a successful struggle for socialism is not possible without first achieving a democratic republic. There is more than an echo here of the discredited theory of stages, first advanced by the Russian Mensheviks, in opposition to Lenin and Trotsky. They argued that the task of socialists was to support the overthrow of the Tsarist dictatorship and establish a democratic capitalist Russia, modelled on the successful bourgeois democratic revolutions that overthrew feudalism in England, France etc. Only after a period of modern capitalist development would there be the material and economic basis for socialism, they argued. 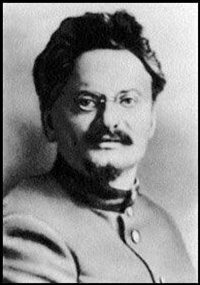 It was Trotsky in his theory of the permanent revolution who drew the conclusion that the bourgeois in Russia were too weak, too tied to the feudal landlords and imperialism, to be capable of carrying through the tasks of the bourgeois democratic revolution. The carrying through of these tasks including land reform, the introduction of democracy, creation of a nation state, and the development of a modern capitalist economy instead would require the leadership of the working class, alongside a movement of the poor peasants and would be merged with the tasks of the socialist revolution, i.e. the breaking of the feudal and capitalist elements of the economy and the state. In practice that is precisely what did happen as the democratic phase of the Russian revolution – February 1917, which solved none of the problems of war, hunger and exploitation – rapidly gave way to the October revolution and the coming to power of the working class through the Soviets, led by the Bolshevik party of Lenin and Trotsky. Ignoring the experience of the worker’s and socialist movement over the last 100 years, the RCN are making a major political mistake by advancing a position that seeks to consciously postpone the idea of the socialist revolution until after the achievement of a democratic republic. By elevating the need to deal with the democratic questions – the abolition of the monarchy and crown powers prior to the winning of a socialist society – to an overarching principle they are effectively saying socialism must wait . This type of approach has led to many a lost opportunity and even defeat for revolutionary movements in the past. The experience of the Marxist and socialist movement internationally has underlined again and again that the democratic tasks of a revolution, if they are to be made far-reaching and permanent, are indissolubly linked to the socialist transformation of society. While fighting for the maximum in democratic rights for the working class and the population generally under capitalism, we have a duty to explain the limitations inherent in capitalist democracy and at all times put forward the case for socialism. That means explaining the key and central role of the working class as the decisive force in carrying through such a task. A victory for either Roseanna Cunningham or Alex Neil – both of them capable and charismatic figures – would have the effect of regenerating interest in politics generally. It would help to shift the ideological centre of gravity in Scotland further to the left and, at the same time, strengthen support for independence. All of this would create a more politicised climate, favourable to both the SNP and the SSP. Apart from grossly exaggerating the left credentials of the SNP contenders, these comments underline that Alan McCombes has assigned to the nationalist movement the key role in radicalising Scottish society. The CWI have rejected this idea. It is the working class moving into action against attacks on pensions, jobs and conditions, alongside the development of the anti-war movement and the movement of young people that will provide the forces that will shift the ideological centre of gravity in Scotland further to the left . The CWI fully recognises that the national question has had and will continue to have a politicising effect in Scotland. But at all times we need to link the national and democratic struggle for the need for a socialist solution. The RCN are also guilty of playing down the role of the working class when they say: The Britain-wide trade union strike wave, which started soon after the initial struggle for Civil Rights in Northern Ireland, was contained more easily by the incoming Labour government of 1974 . While after the defeat of the1984/85 miners strike: The miners’ power was broken; whilst Tory and Labour governments had to make a series of concessions to the Irish Republican resistance . It is frankly ridiculous to dismiss the movements of the working class from 1970-74 in this way. They included two miners’ strikes, the UCS occupation on the Clyde, strikes of steel workers, car workers – 90% of which were unofficial – building workers, the Saltley gates mass pickets, the jailing of building workers and dockers which brought Britain to the verge of a general strike. These momentous class battles halted the Heath government’s plans on anti-trade union laws and delayed the capitalists’ offensive on workers’ rights. Overall 44 million days were lost through strike action in these four years. Even worse, from the point of view of the RCN, is the attempt to elevate the methods of individual terrorism by the republican movement in Northern Ireland to a higher form of a struggle than that of mass action by the working class. The analysis made by the RCN of the experience of the Republican movement in Northern Ireland is wrong and contrasts vividly with that of the CWI. When the IRA campaign began in earnest in 1971, it drew mass support from Catholic working class youth in response to state repression, particularly internment, and to poverty and unemployment. Thousands of young people looked to the IRA because they felt that the mass civil rights campaign had not been listened to and that the IRA’s methods of individual terrorism offered a more effective way of fighting back. The silence of the leaders of the labour movement, who drew back from any involvement in an increasingly difficult situation, meant that there was no class explanation on offer that could have provided an alternative to the thousands of young people who were getting caught up in paramilitary organisations at this time. The only way to overthrow or defeat a modern capitalist state is through mass action by the working class. Individual terrorism substitutes the actions of a small group of individuals for the mass actions of a class and can never succeed. The Provisional campaign was doubly counter-productive in that it was based on a minority of the population and, no matter what the intent, had the effect of antagonising the Protestant majority and of dividing and weakening the working class. By the mid to late 1980s, the campaign had effectively run its course. The IRA had the capacity to carry on at a low ebb for a further period but the leadership had come to realise that there was no hope that the military campaign would succeed. The emphasis the CWI has put on united working class action was underlined recently by the recent strike action by postal workers, Catholic and Protestant, in Northern Ireland. Royal Mail bosses were forced into a climbdown by this action. The potential for a united working class movement to defeat the bosses’ offensive and cut across sectarian division was graphically illustrated as these workers organised a march up the Shankill Road, across the peace line and down the Falls Road. Sectarian politicians on all sides made speeches at the peace line but only the CWU members and the Socialist Party with our banner “For workers unity” marched the whole route. On both the Shankill and the Falls local communities came out to cheer and support the postal workers. A way forward If the SSP is to recover and move forward as a viable vehicle for the struggle for socialism it has to do so on a clear political basis. That means putting forward a fighting day-to-day programme that addresses the immediate issues facing the working class. On pensions, the war in Iraq, privatisation, poverty, wages and on any number of questions the SSP can put forward a distinctive alternative to the neo-liberal assaults on the working class. By building and rebuilding a reputation for defending the interests of the working class and the oppressed the party can move forward. With a principled approach to the national question, defending the democratic rights of the Scottish people while explaining the need to join the struggle for socialism the SSP can also advance its position. However, that will require the SSP leadership to alter its course, away from the increasing tendency to downplay socialism and the increasing trend towards nationalist ideas. If not, an opportunity will have been lost that will complicate the task of building Scottish Independence Convention a mass socialist alternative to neo-liberalism and capitalism in Scotland. The world has turned since the “End of History” was declared by the supporters of capitalism after the collapse of the Stalinist regimes of Russia and Eastern Europe. Capitalism is a failing system. The period we are moving into will see new and growing opportunities to strengthen and deepen the support for socialism and Marxism. We believe that the CWI has an important role to play in that process. The debates on political differences can hopefully help to clarify the way forward for the SSP and the wider workers’ movement. As always Allan Armstrong’s analysis of the Scottish Independence Convention (SIC) is a welcome, well-developed and considered response. Indeed Allan’s critiques in previous editions of Emancipation & Liberation have helped clarify my own thoughts on this matter. It seems strange that anyone proclaiming themselves a republican could take issue with what is said in his latest contribution. However, as Allan points out, there are ‘republican socialists’ who have seemingly relegated republicanism, let alone socialism, to the distant future in order to participate in the pan-nationalist alliance, Independence First. Given these theoretical somersaults currently taking place Allan’s principled republican stance aims to remove the ambiguity from the SSP’s republican agenda. Overcoming RCN objections to the SIC? Despite Allan’s valid criticism of the SIC though I get the feeling that much of the RCN objection could be overcome on paper simply by altering any future referendum on the constitutional question to accommodate a republican position within a multi-option STV set-up. Perhaps, however, I am wrong? If, as seems likely, the SIC plans to limit itself largely to the question of a referendum this move would allow the SSP the total freedom to campaign within and outwith the SIC on a republican basis. Could the SNP, which walked out of the Constitutional Convention in the 1989 over the issue of a multi-option referendum, now turn around and deny that democratic option when they are already committed to holding a referendum on it within the first term of a future independent Scottish parliament? Well, probably! But it would take an opportunist turn which surely the SSP and, nominally republican, Greens, could expose to their embarrassment. But would this republican option change the SIC? Would even the formal rejection of the Crown Powers by the SIC fundamentally change it? You see the one major criticism I have to make of the RCN paper is that in attacking ‘nationalists’ in the SSP (the left prefix having been dropped somewhere along the way) it only advances a left republican position as an alternative. This is a criticism that can justly be levelled against previous contributions from the RCN on the ‘national question’ as well, and is a matter to which I shall return. Certainly the thrust of Allan’s latest paper is that the differences centre on the matter of the Crown Powers. However when Allan criticises the ‘stagist’ approach of independence first, then a republic, then (presumably) socialism, the RCN’s alternative is merely to jump one step ahead and offer a republic first then (presumably) socialism. The stages haven’t disappeared; it’s just that there are less of them! Allan’s basic criticisms of a post independence Scotland ( under the crown ) are correct, but the thing is that even a post independence Republic would still face many of the same pressures. Whilst there may not be the opportunity for the ruling class to exert the direct political control exercised through the Crown Powers, there will still be the direct economic, and therefore political, control exercised not just by the native ruling class, but also by perfidious Albion herself. Allan rightly points out that it is a low tax haven for the global corporation , where Shannon Airport is used repeatedly by the US Airforce in a breach of Irish neutrality and where the 26-County government jails the Shannon 5 on behalf of Shell. Elsewhere he notes that Irish UN ‘peace keepers’ helped to provide cover for the joint Belgian Union Mining company/CIA initiated overthrow of the radical Patrice Lumumba in the Congo in 1960 . While Allan rightly berates the SNP for highlighting the 26-County ‘Celtic Tiger’ as a model form of independent nationhood, he neglects to mention that this model arose without a Crown Power in sight! The Irish Republic has won the political franchise to manage the Southern part of Ireland on behalf of the global corporations and US/British Imperialism. There is no reason to believe that the removal of Crown Powers from a post-independent Scotland would result in a different scenario. That is unless the republican agenda that removes these powers is inherently anti-imperialist, but that anti-imperialism has to have a far wider remit that restricting itself to the use of Crown Powers. Again taking the example of the 26-Counties Allan notes that the Guinness family made their peace with the Irish Free State after 1922 . However when he correctly observes that we could expect a similar move by Scottish unionist business as it repositioned and remarketed itself as Scottish, if Scotland becomes ‘independent’ under the Crown , he fails to clarify that the exact same situation would exist were Scotland to become independent under a Republic! Capitalism will continue unhindered whether an independent Scotland retains the Crown Powers or not that is so long as we allow the question of the anti-democratic Crown Powers to assume the prominence that are being ascribed to them presently. For example Allan also states that, If the new Scottish constitution wasn’t republican from the outset, a new Scottish ruling class would still be able to resort to those Crown Powers . Whilst this is unquestionably true it must be noted that the absence of Crown Powers has not altered the strength or ability to oppress the working-class of, for example, the US ruling elite. In any case in times of ‘national emergency’ or ‘crisis’, some sort of Emergency Powers Acts can always be voted through on behalf of the ruling class by any parliament, giving a democratic facade to the same situation. To build an anti-imperialist republicanism it is essential to challenge not just the lingering political effects of Imperialism but its underlying economic rationale. After all we are dealing with a form of total economic control exercised not though ‘gunboat diplomacy’ or direct political control, but through the continued existence of the capitalist system. Without challenging capitalism, we will not fundamentally challenge the structure of imperialism. That’s not to say that complete self-determination for Scotland will not present problems for British Imperialism, of course it will. Imperialism does not like constitutional upheaval unless it is in its own interests, and taking history as a precedence there are no conceivable circumstances under which it would be in the interests of Imperialism to breakup the British imperialist state. Likewise there are no conceivable circumstances under which the genuine anti-imperialist could, or should, oppose the struggle for complete self-determination from the British imperialist framework, such a position belongs unquestionably in the camp of Social Imperialism. The question is how to show leadership of the national liberation struggle and move it decisively to the Left, not jumping on any bandwagon that comes along. 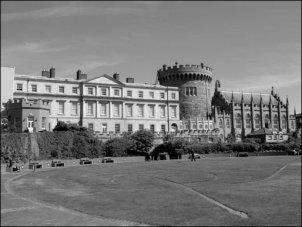 If you remove the English army tomorrow and hoist the green flag over Dublin Castle, unless you set about the organisation of the Socialist Republic your efforts would be in vain. England would still rule you. She would rule you through her capitalists, through her landlords, through her financiers, through the whole array of commercial and individualist institutions she has planted in this country. It is a message over a century old that has not lost its relevance and which we ignore at our peril. After all, the political front of all states under capitalism is merely a screen behind which the ruling class exerts its control. It is only by confronting Britain’s imperial interests which exist through its economic control, not just its direct political control, that a genuine anti-imperialism will be unleashed. Primary to this is not the question of Crown Powers, but that ownership of the land and resources of Scotland are the common property of the Scottish people. A notion which immediately attacks the basis of capitalism and private property, that is it attacks the underlying economic basis of imperialism. A sentiment that is found within Connolly’s influence on the 1916 Declaration of Independence which asserts the right of the people of Ireland to the ownership of Ireland . It’s about drawing together a whole programme of such demands that place the Left to the forefront of the national liberation struggle and that brings to the fore a radical, progressive and working-class agenda. Yet the crux of the RCN argument with the SSP majority is that a Republic is a more democratic form of bourgeois democracy than ‘independence under the Crown’. Let’s be clear that any anti-imperialism that constricts itself to questions of bourgeois democracy rather than the social relationships which govern society under Capitalism is just as guilty of the stagist approach taken by the so-called nationalists within the SSP. The time is past ripe for the establishment of socialism in Scotland. In any developed, industrialised nation the question of socialism should never be off the agenda for the working-class. In those industrialised nations with an unresolved national liberation struggle, notably in these islands, Scotland, Wales and Ireland the only answer is the Workers Republicanism of James Connolly and John MacLean. Republican Socialists should have no time for reforming capitalism, for installing new regimes to manage capitalism in Scotland or generally propping up the decaying rule of imperialism. Comrades it is this reformist agenda that is the heart of the problem in the SSP. Allegations of nationalism merely attack the symptom rather than the cause. Instead the only genuine anti-imperialism is one which calls for no separation of the class struggle from the national liberation struggle; on with the class war; onto the Scottish Workers’ Republic!